GNIRS was built by NOAO in Tucson, Arizona and delivered to Cerro Pachón in late October 2003. Commissioning of the majority of the modes took place in stages during 2004. GNIRS was first made available for science use in 2004B. 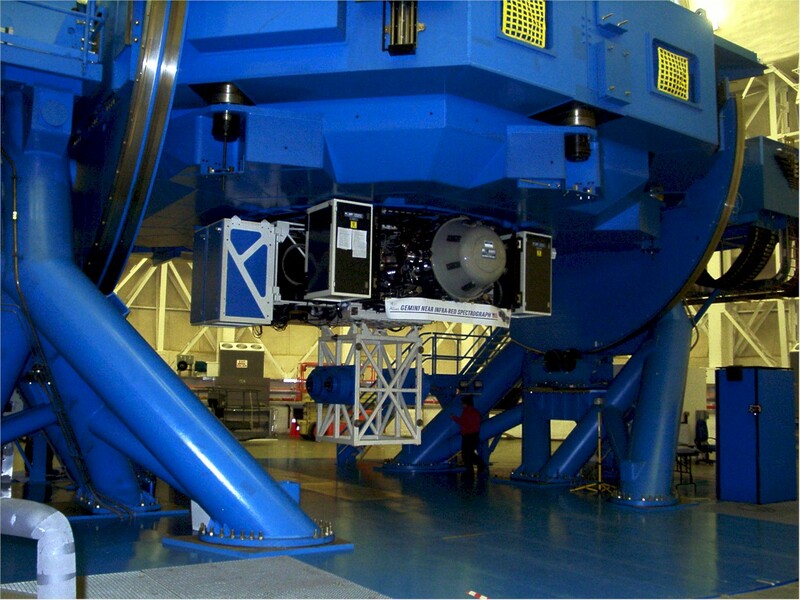 The instrument was damaged in 2007 while at Cerro Pachón and was repaired at Gemini North. Since 2010 it has been available for use on the Gemini North telescope. GNIRS offers a wide variety of spectroscopic capabilities. These include long-slit (single order) spectroscopy within the 1.0-5.4 μm range at 2-pixel spectral resolving powers, R, of approximately 1700, 5000 and 18000 with a choice of two pixel scales (0.15"/pix and 0.05"/pix), and cross-dispersed spectroscopy giving complete 0.9-2.5 μm coverage at R~1700 and partial coverage at R~5000. A variety of slit widths from 0.10 to 1.0 arcsec are available. The different pixel scales are achieved with four cold-changeable cameras of "long" and "short" focal lengths optimized for "blue" (0.9-2.5 μm) and "red" (2.8-5.4 wavelengths). GNIRS also has limited imaging capabilities. The instrument can be used with ALTAIR (adaptive optics - utilizing either a natural or laser guide star) from 1 μm to 2.5 μm. Performance of ALTAIR is poor in the 3 - 5 μm range. GNIRS is available for queue, priority visitor, and classical spectroscopic observations with the short-blue, long-blue, and long-red cameras. The short-red short camera is currently not available for use. YJHK seeing-limiting and adaptive optics (AO) imaging is available via the acquisition keyhole. The Instrument Scientist for GNIRS is Andrew Stephens. Gemini staff who also support GNIRS include Marie Lemoine-Busserolle, Trent Dupuy, Meg Schwamb, Matt Taylor, and Siyi Xu. The team can be contacted at gnirs_science@gemini.edu.